Not sure what to do with leftover phyllo? Try these. 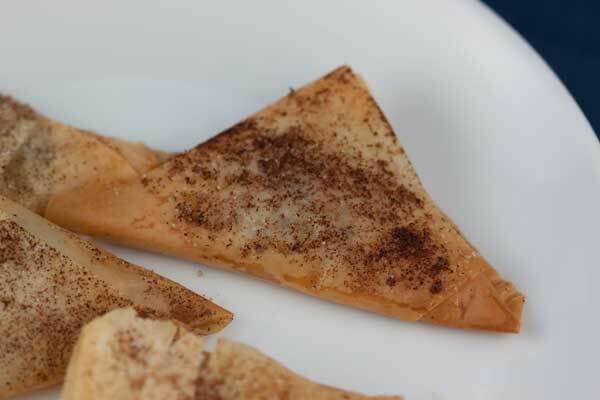 You'll get three triangles for every sheet of phyllo. Lay your phyllo dough in front of you with short sides on the bottom. Brush it with melted butter or spray with butter flavored cooking spray if that's what you prefer. Using a pizza cutter, cut it into 3 long strips. Put approximately 1 heaping teaspoon of finely chopped dark chocolate at the bottom of one strip, slightly to the left, then fold upward like a flag and make a neat triangle. Brush with a little more butter and sprinkle with cinnamon sugar. Arrange triangles on a baking sheet and bake at 350 for about 10 minutes or until golden.